Cheese Education Guild: Learn by tasting the best in cheese. Here’s a great gift idea for the budding caseophile in your life—even if the caseophile happens to be you yourself. A class in Cheese Appreciation will be offered by the Cheese Education Guild, on Wednesday evenings during January-February at Cheesewerks in Toronto. * Indicates tasting will be included in the presentation. The cost of the eight-week course is $575 + HST which covers the class, cheese for tasting, workshop materials, testing and Certificate of Achievement. The class is limited to 30 persons. The first class is January 9, 2013, at Cheesewerks, 56 Bathurst Street, Toronto. Mario Krisko (left) and Lisa McAlpine of Cheese Education Guild. Your instructors are Lisa McAlpine and Maria Krisko who took over the Cheese Education Guild after founder Kathy Guidi retired to the U.S. Virgin Islands two years ago. The Cheese Education Guild is the oldest cheese school dedicated to cheese appreciation in Canada. It was founded in 2005 by Guidi when she launched Artisan Cheese Marketing as a cheese public relations, education and marketing company designed to meet the education needs of the growing North American cheese industry. Through a series of three Cheese Appreciation courses, students explore and compare hundreds of cheeses so that they can experience the artistry in a truly great cheese and understand the challenges facing cheesemakers. The January-February course is Cheese Appreciation, Level 1. Click here for more information on the Cheese Education Guild and its offerings. 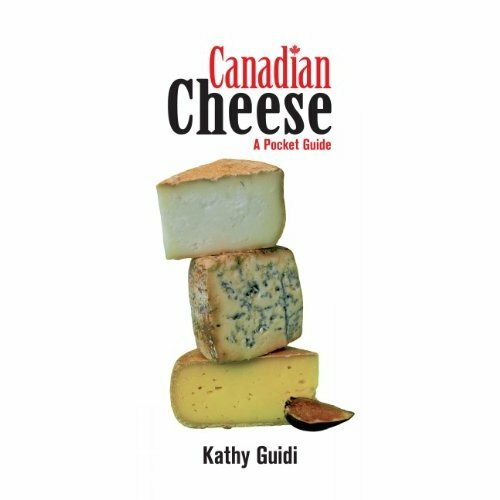 Click here for information on Canadian Cheese: A Pocket Guide authored by Kathy Guidi, a must-have, must-read for any cheese lover. Be the first to correctly identify the three cheeses pictured on the cover of Canadian Cheese: A Pocket Guide, by Kathy Guidi, and you’ll win a three-day VIP pass to The Great Canadian Cheese Festival worth $400. Click on the image for a better view of the three cheeses. The Great Canadian Cheese Festival will take place June 4-5 in Picton, in the heart of Prince Edward County, Ontario’s fastest-growing culinary destination. Click here for complete information. Those are regular prices. Savings are possible by taking advantage of earlybird pricing until April 4. Click here for the Cheese Festival box office. Canadian Cheese: A Pocket Guide is an outstanding reference to some of the newest, best and most popular cheese made in Canada. It includes concise tasting information for 180 cheeses from coast to coast, with emphasis on artisan varieties, while providing enchanting author and cheesemaker anecdotes, useful information on buying and serving, as well as author insights on popular cheese topics like raw milk cheese, discerning quality, whether to eat the rind (or not), cheesemaking and ingredients. Kathy Guidi is founder of Cheese Education Guild, a school dedicated to advancement of cheese knowledge and appreciation among food professionals and cheese lovers. She is also president of Artisan Cheese Marketing, a unique cheese public relations and business development company. With more than 35 years of experience working as a consultant and maitre fromager (cheese master) with cheesemongers, trade organizations and producers, Kathy continues to influence and lead domestic and international cheese circles through her passionate training sessions and public speaking engagements. Born and raised in Milwaukee before moving to Chicago for school and career, Kathy has called Toronto home for 25 years. Canadian Cheese: A Pocket Guide, published by McArthur & Company of Toronto, is available through Amazon.ca or Indigo.ca and in book stores, cheese shops, select wineries as well as Costco and supermarket book sections across Canada. * Employees and associates of McArthur & Company, associates and students of Cheese Education Guild and Artisan Cheese Marketing, associates of Cheese Lover Productions, producers of The Great Canadian Cheese Festival, and cheese professionals are ineligible. The contest is open exclusively to consumers and not the trade. 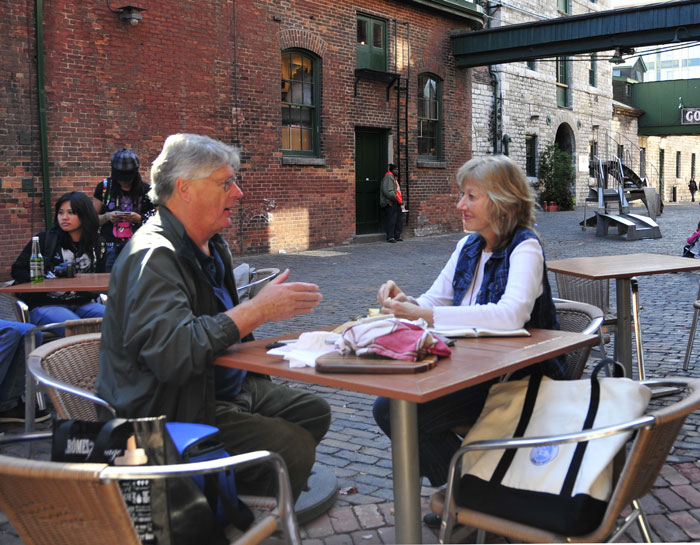 Georgs Kolesnikovs and Kathy Guidi taste and talk cheese outside A Taste of Quebec in Toronto. Photo by Tetsuto Ozawa. You can tell two people meeting for an informal cheese tasting are head-over-heels in love with cheese when they both show up with cheese board and cheese knives in hand. Kathy, who has forgotten more about cheese than most of us will ever know, is the author of the newly published Canadian Cheese: A Pocket Guide and a long-time cheese educator and consultant to cheesemakers and cheesemongers. Le Monnoir, Fromagerie Au Grés des Champs, bronze. 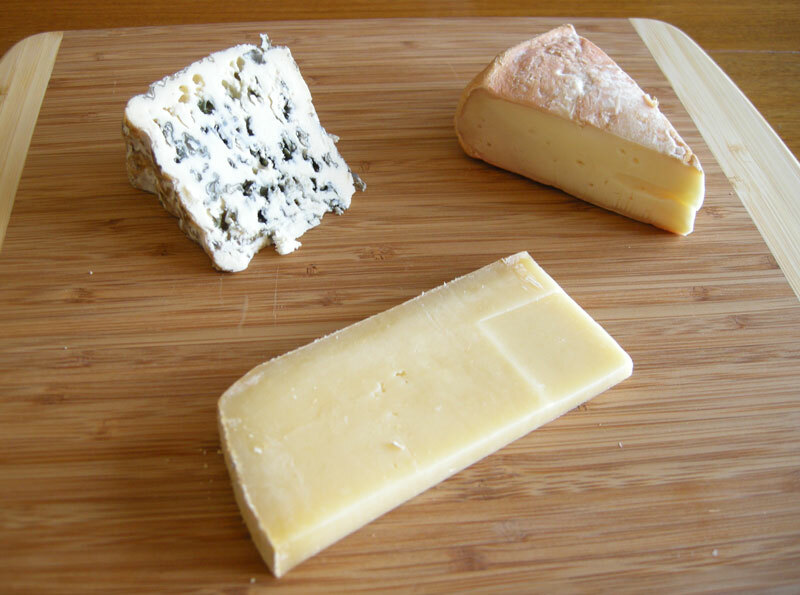 The first two are generally available at A Taste of Quebec managed by Thomas Sokoloski and other cheese shops. The third I’ve had to order from Leslieville Cheese Market; more on Le Monnoir in a future post. The dairy goodness of Louis d'Or tastes as good as it looks. Louis d’Or is a relatively new firm cheese made by Jean Morin, a fourth-generation dairy farmer, at Fromagerie Presbytère housed in a former rectory across the street from the Morin organic dairy farm in tiny St. Elizabeth de Warwick, about two hours east of Montreal. When I visited Fromagerie du Presbytère last summer, Jean Morin told me he was proudest of Louis d’Or of all the cheese he makes, and that includes Bleu d’Élizabeth, a favourite at CheeseLover.ca, which was the Caseus gold medalist in 2009. “It’s a beautiful cheese,” Kathy said of Louis d’Or, nutty, with floral notes. Me, I love the milky richness of the cheese, a testament to the organic raw milk provided by the Morin family’s Holstein and Jersey cows. The Louis d’Or we had was maybe a tad dry as it didn’t quite have the knock-your-socks-off quality that I recall from last summer. 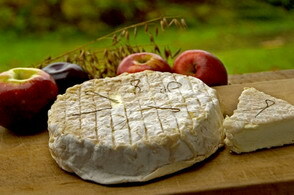 Flavourful Hercule de Charlevoix is one of the many outstanding Quebec cheeses. There was no question our Hercule de Charlevoix was at the top of its game. 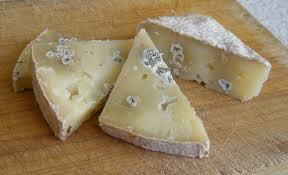 Fruity, creamy, complex, with a delicious rind. One of the great cheeses of Quebec, no doubt about it. Another example of what a powerhouse of gastronomy the Charlevoix region of Quebec is—and how Jersey cows often lead to superb cheese. “Don’t let the bold aromatics intimidate you from trying Hercule,” Kathy writes in her book. The flavour is actually quite refined. Bleu de la Moutonnière is an amazing blue made by Lucille Giroux. For our third cheese, Kathy recommended we try Bleu de la Moutonnière—and I am so glad she did! If you believe a blue cheese must be soft, creamy and veined, you might be put off by the appearance of this Bleu. It looks more like a clothbound cheddar than a blue, although bursts of blue are clearly visible. But so much taste, so much flavour, and very blue indeed. 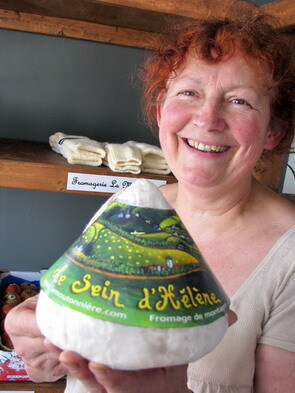 Kudos to cheesemaker Lucille Giroux and her partner Alistair MacKenzie. When I gave two budding caseophiles a taste of all three cheeses a few days later, they could not say which one was their favourite because all three seemed so outstanding to them, each in its own distinctive way. That’s the sign of memorable cheese plate, isn’t it? All cheeses so tasty you cannot pick only one as a favourite. Three months after his last visit to Quebec, Georgs Kolesnikovs, Cheese-Head-in-Chief at CheeseLover.ca, says he’s overdue for another trip to La Belle Province. At last, an up-to-date book on Canadian cheese loaded with information and insight! Most of us are intimidated in front of the cheese case with so many varieties to choose from. We end up buying the same familiar cheese even when we set out to try something new. Most Canadians have no idea what they’re missing! New Canadian cheeses emerge all the time! Canadian Cheese: A Pocket Guide is a reference to some of the newest, best and most popular. author insights on popular cheese topics such as raw milk cheese, discerning quality, whether (or not) to eat the rind, cheesemaking and ingredients. For corporate or special sales, please contact the publisher directly: Ann Ledden, VP Sales, McArthur & Company. Book signings can be arranged by contacting Devon Pool, Director of Publicity, McArthur & Company. See the Artisan Cheese Marketing calendar for scheduled book signings and event dates. Kathy Guidi is the founder of Cheese Education Guild which in September will again present its in-depth Cheese Appreciation 1 program. It’s the perfect way to learn about cheese while savouring and comparing up to 10 cheeses each week during the 8-week certificate course. cheesemakers and cheese marketers AND caseophile (cheese loving) enthusiasts. 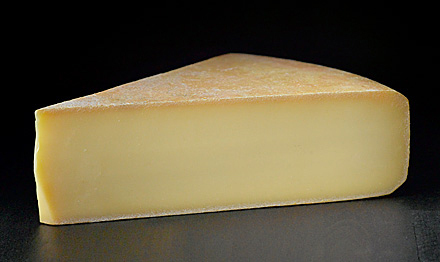 For complete information, visit www.artisancheesemarketing.com. 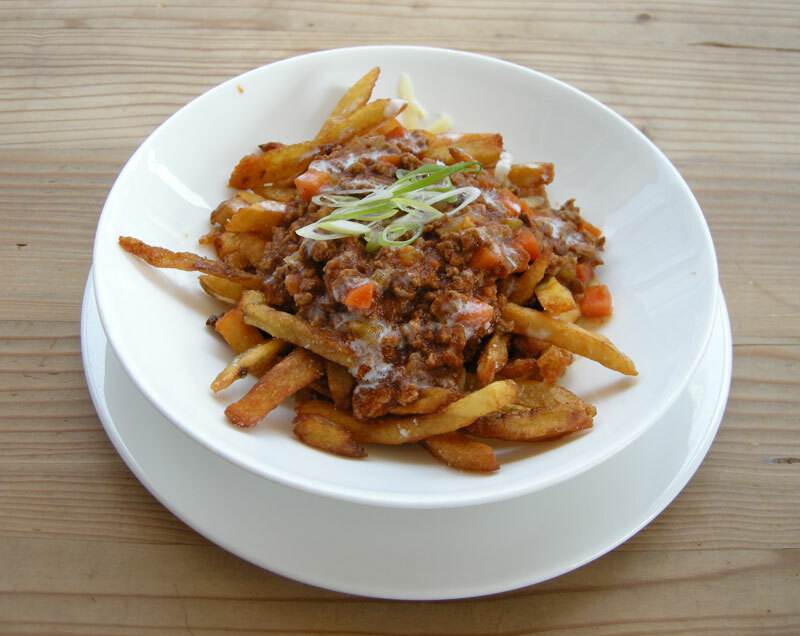 Jamie Kennedy's take on poutine at Gilead Cafe. Planning is well under way for the first Great Canadian Cheese Festival in 2011. That often means lunch meetings which, happily, means cheese on the table. I had a chance to meet with Canadian cheese maven Kathy Guidi over lunch at Jamie Kennedy’s Gilead Cafe recently. What a treat it was to talk to Kathy—what with her decades of experience in Canadian cheese—and to enjoy one of Chef’s unique poutines: perfect frites with a healthy dollop of sauce bolognaise laced with Monforte Dairy’s Toscano cheese. I could have easily ordered a second serving but we had decided on a cheese plate for dessert, so I had to hold myself in check. Le Rassembleu, an organic farmstead blue cheese from Fromagiers de la Table Ronde in the Laurentides region of Quebec. It has a lively creamy flavour, with the aroma of hay. The producers are fourth-generation cheesemakers. Mouton Rouge, on the other hand, pleases the nose with a fresh and grassy aroma. 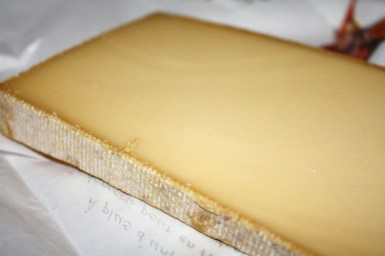 A raw sheep-milk cheese created by Ewenity Dairy Co-operative in Southwestern Ontario, it has a lovely buttery taste that plays against the nutty reddish rind. Grey Owl, a pasteurized goat-milk chèvre from Fromagerie la Detour in the Bas-Saint-Laurent region of Quebec, near the New Brunswick border, looks and tastes outstanding, from its snowy white interior to riper regions to the black ash exterior. Le Bleu d’Élizabeth, Pied-de-Vent and Louis d'Or at the home office. Pied-de-Vent, from the Magdalen Islands in the Gulf of St. Lawrence, is an an all-time favorite of mine. 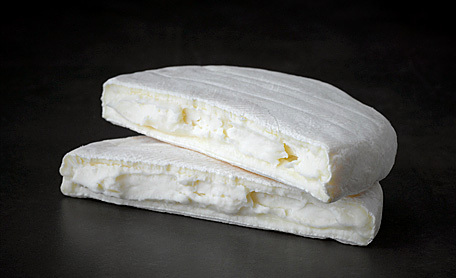 Smelly, creamy and tasty, Pied-de-Vent is my idea of a great cheese. Despite what some cheesemongers may tell you, it is available in Ontario. Le Bleu d’Élizabeth comes from the same Fromagerie du Presbytère and is an outstanding example of a Quebec blue. No, it’s defintely not named after Queen Elizabeth but rather Sainte-Élizabeth de Warwick. The creamery occupies a former rectory in the village. There is one other cheese plate in my notes from another working lunch but it was so disappointing that the proper thing to do would be to return to the name restaurant for another tasting before naming names. One name I’d like to mention is Ezra’s Pound, a fair-trade coffee shop on Toronto’s Dupont Street. I’m so glad Andy Shay, a man of many talents when it comes to cheese, suggested we meet there as the croissants are to die for. Have we mentioned that Georgs Kolesnikovs, Cheese-Head-in-Chief at CheeseLover.ca, loves his cheese? A student in the Cheesemaking Technology course at University of Guelph learns how to pour Camembert-style cheese into forms. Cheese education in Ontario is thriving, as evidenced by the array of tasting classes catering to those who wish to enhance their appreciation of cheese. But what about individuals looking to carve out a career in the cheese business who require a more thorough, professional education? Here’s a roundup of courses available to mould a fresh batch of cheese professionals. The University of Guelph has been offering some version of its cheesemaking course since 1893, though its present professor, Art Hill, began teaching his Cheesemaking Technology program with the Food Sciences department in 1986. The program—designed for artisan and commercial cheesemakers, cheese hobbyists, and government and sales personnel who work with cheesemakers—focuses on the science and technology of cheesemaking. Students attend lectures and apply the principles learned in a cheesemaking laboratory. “The focus is on understanding the manufacturing principles of technological families of cheese, rather than becoming expert in the manufacture of particular cheese varieties,” says Professor Hill. The program is offered annually in the spring and runs for five days. The next course offering will run from April 27 to May 1, 2015. Those interested can visit the course website. Artisan Cheese Marketing, a cheese education and public relations company founded by cheese industry expert Kathy Guidi, was the first business in Canada to recognize the demand for professional cheese appreciation classes. In response, the company developed the Cheese Education Guild in 2005, the first institution in Canada to offer a certificate-level cheese education course. To earn a Cheese Education Guild certificate, students must complete three 24-hour appreciation courses. The courses aim to develop students’ tasting and sensing abilities while building cheese vocabulary and knowledge. Cheese Appreciation courses 1 and 2 each cost $550, while the final Cheese Appreciation 3 costs $620. Information on upcoming courses is listed on the company website, and can also be obtained by emailing Artisan Cheese Marketing. George Brown College has also sensed a demand for professional cheese education classes, and so the school began offering a Professional Fromager Certificate in January 2010. The course was developed by Scott McKenzie, a graduate of the Cheese Education Guild, and is offered through the college’s Hospitality and Culinary Arts department. The program consists of six classes, each focusing on an element of cheese appreciation and knowledge. 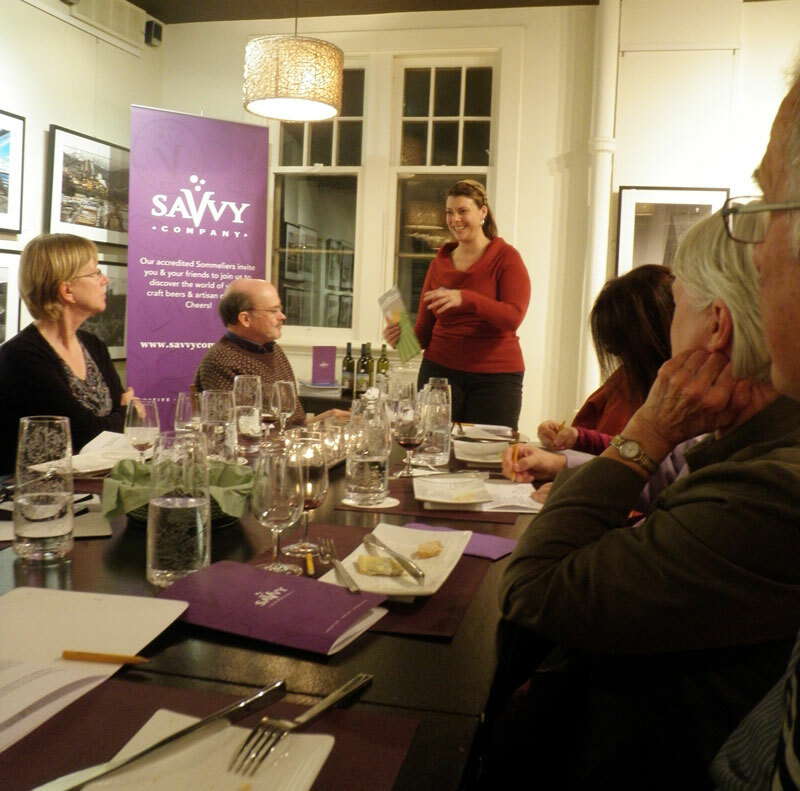 The program includes classes on tasting and criticism, affinage, and pairings. Individual classes range in cost from $231 to $321, with the total program tuition fees amounting to $1,556. For more information, contact the department at (416) 415-5000 ext. 2517 or via email. Monforte Dairy is developing its own unique program that will bring the company into the ranks of professional cheese educators. Unlike other programs available in Ontario, Ruth Klahsen, Monforte’s owner and head cheesemaker, has decided to offer an apprenticeship program that focuses on the craft of artisan cheesemaking. “The school is intended to preserve and grow the art of artisanal cheesemaking as opposed to industrial cheesemaking. Ontario was once the dairy capital of Canada and Monforte would like to see more artisanal cheese operations across the province again. It would be our hope that the new cheesemakers would then be able to start up their own dairies,” says Maureen Argon, Monforte’s communications specialist. Monforte is hoping to attract apprentices who already hold a keen interest in cheesemaking, and who have some food production knowledge. The program is still in the development stage, with cheese consultant Neville McNaughton building a curriculum. Monforte is also looking into partnership possibilities with Ontario colleges. The program will run over a two-year period, from January to April. For more information, contact Monforte Dairy through the company website. Though the popularity of cheese education courses is on the rise in Ontario, some experts believe a more traditional education is all a cheese enthusiast needs to learn the business. Julia Rogers, founder of Cheese Culture, which offers cheese classes and events to the public, says that while these courses can contribute to an individual’s overall cheese education, on their own they are not enough to prepare a person for retail or entrepreneurial work in cheese. “If you want a career in cheese, you’ve got to work in cheese, which means washing dishes, washing floors, getting up early, stressing over margins and expiry dates and Christmas pre-orders, fielding every consumer question known to humanity, juggling CFIA (Canadian Food Inspection Agency) and Public Health inspectors, navigating the minefields of fickle urban trendsetter taste, meanwhile smiling . . . and doing it for minimum wage, 360 days a year,” Rogers says. If, after paying their dues in such a gruelling setting, aspiring cheese experts still wish to pursue a career in the business, Rogers recommends seeking apprenticeships with industry professionals and foreign learning experiences to polish their skills. A journalism graduate and budding turophile, Phoebe Powell last wrote for CheeseLover.ca about getting to know sheep’s-milk cheese.